Caption: A monarch caterpillar hangs down the droopy tip of a common milkweed leaf. I hope you enjoy the contrast of the brightly striped monarch again the earthly colored background. This was one of my 5th-instar caterpillars and shortly after this he transformed to the next phase of monarch butterfly metamorphosis...the monarch chrysalis. When a caterpillar is ready to change, he will find an object to hang upside down from, like the underside of a leaf. However, in my 25 years of raising monarchs I have only seen one chrysalis in the wild...and that was on the trunk of a large oak. I have no idea where the caterpillars from our milkweed patch crawl off to and how many survive. My gut tells me not many, and that's why I try to take in the majority I come across each summer. 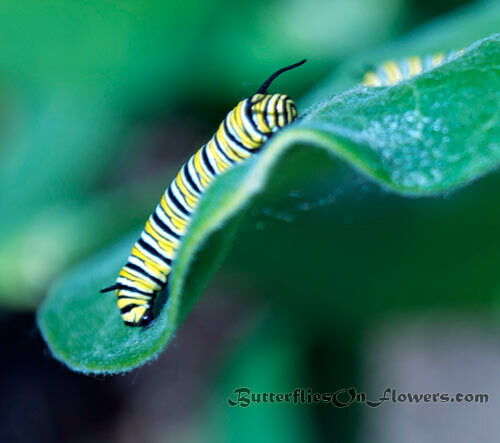 Caterpillar Facts: Each developmental stage of the caterpillar is referred to as in instar. The fifth and final instar features the caterpillar at its most monstrous, a whopping 25-45 millimeters long.